Malaga airport – Costa del Sol continues to grow and is positioned as the fourth most important in Spain. In the first half of this year it has seen an increase in both passengers and operations, as reported by AENA (Spanish Airports and Air Navigation). 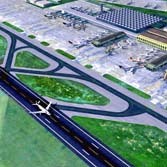 After four years of work is now finished the second runway at Malaga airport and after a test period will be opened probably in the first quarter of 2012. The new runway will double the number of operations to 72 flights and over 9,000 passengers per hour.